Chabad rabbis gather in N.Y.
Twelve Chabad Lubavitch emissaries to British Columbia joined 5,600 rabbis and communal leaders from all 50 U.S. states and 100 countries, hailing from as far away as Laos and Angola, Ghana and Uzbekistan, at the International Conference of Chabad Lubavitch Emissaries (Kinus Hashluchim), which took place Nov. 16-20 in Brooklyn, N.Y. The annual event, the largest Jewish gathering in North America, is aimed at reviving Jewish awareness and practice around the world. The rabbis – each embracing multiple roles and responsibilities – explored relevant issues, and learned from professionals and colleagues with years of experience. The topics covered ran the gamut of their concerns: combating antisemitism, stemming the tide of assimilation, understanding troubled relationships, inclusion, and a conference within the conference for rabbis who serve students on college campuses, ensuring a lasting impact on the next generation of communal leaders. This year’s conference brought added significance as the world marks 50 years since the Rebbe – Rabbi Menachem M. Schneerson, of righteous memory, considered the most influential rabbi in modern history – initiated the Mitzvah Campaigns, an historic undertaking that took Judaism beyond the institutional walls, impacting millions of Jews with no or minimal Jewish engagement. The conference included a visit to the Rebbe’s gravesite in the New York City borough of Queens. 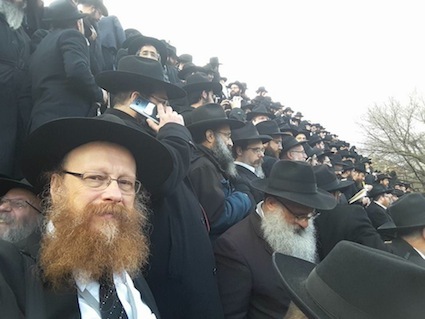 Additional highlights were the “class photo,” where thousands of rabbis posed for a group picture in front of Chabad Lubavitch world headquarters in Brooklyn. There was also a gala banquet, where the rabbis were joined by admirers, supporters and layleaders from their respective communities for a sit-down dinner, which set a record for being the largest in New York. The conference serves to connect Chabad Lubavitch emissaries with one another. This gives the participants, especially those going back to far and isolated outposts, an exhilarating send-off, coupled with the sense that they are not alone. Representing British Columbia were rabbis Yitzchak Wineberg, Yechiel Baitelman, Binyomin Bitton, Avraham Feigelstock, Mendy Feigelstock, Shmuly Hecht, Meir Kaplan, Mendy Mochkin, Dovid Rosenfeld, Falik Schtroks, Levi Varnai and Schneur Wineberg.